Artisan's work suit 02100/221867 B/Green one piece. This is an acid repellant overall in a one piece boiler suit style. This means it will cover your body from the neck down to your ankles and wrists. Should it get acid onto it , it will repel the acid and it will take much longer than regular materials to get holes while resisting absorption. It comes in a Dark Bottle Green colour so you can easily tell it from your average overall / boiler suit . Good for people working in the chemical manufacturing industry as well as other industries where hazardous chemicals are used and will help protect the wearer and make the overall last longer. It has been SABS tested and approved so you can be assured that it is made to the highest standards of quality. 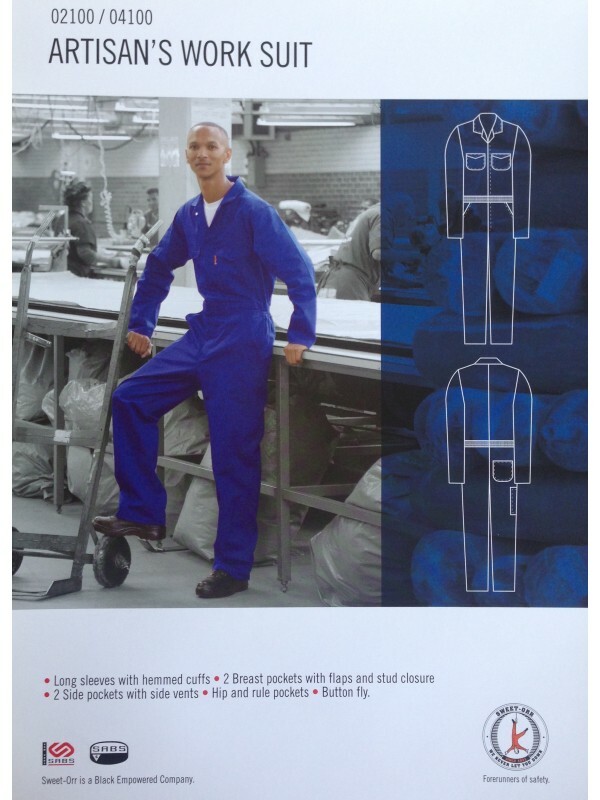 It is a tough durable boiler suit / overall and will last you a long time. It is ideal in working with grease and other staining agents as they will not show up easily and should wash out completely. This overall is 65% Polyester and 35% Viscose making it tough and chemical resistant, it has buttons to close the front, making it breathable and adjustable for your comfort. The boiler suit / overall is made from a 300gm 65% Polyester 35% Viscose material and is SABS quality approved. if you have any questions please feel free to write to us using the contact us page for more information.